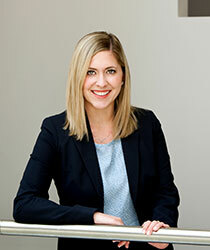 Lauren E. Leader « James McElroy & Diehl, P.A. Lauren Leader joined James, McElroy & Diehl in 2013, and she became a partner in 2018. Lauren’s practice primarily focuses on family law, including issues relating to divorce, child custody, child support, spousal support (postseparation support and alimony), equitable distribution, and domestic violence. In 2010, Lauren received Bachelor of Arts degrees in both Journalism and Political Science from the University of North Carolina at Chapel Hill. Lauren then returned to her hometown of Raleigh, NC, where she earned her Juris Doctor from Campbell University School of Law in 2013. While in law school, Lauren participated in the 50B Domestic Violence Project and was a finalist in the Richard T. Bowser Client Counseling Competition. In her spare time, Lauren enjoys spending time with her friends and family, painting, traveling, and attending Myers Park Presbyterian Church.